I can't tell you the date and time that our family began our real food journey, but I remember the conversation that started it all. Like most evenings, I was in the kitchen and Hillbilly was in the living room doing some reading online. Like most evenings, when he came across some interesting tidbit, he would share it me. I have to admit that frequently, those tidbits would go in one ear and out the other. With a hundred other things on my mind, I would make some sort of acknowlement ("Huh. That's interesting.") and carry on with what I was doing. This particular evening was no different than any other...except something about what he said sunk in slowly. That something was about to change everything. Hillbilly: Hey babe, listen to this - there is a company that is making these seeds called RoundUp Ready. Hillbilly: Yeah, they can spray RoundUp on the crops and it kills the weeds, but doesn't kill the plants. Me: Wait a minute. What?!? Me: They spray the RoundUp on the plants? Hillbilly: Yeah. It kills the weeds, but doesn't kill the plants. Me: That can't be healthy. Hillbilly: Yeah. And get this - the company that makes RoundUp also makes the seeds. Me: I think I'll do some reading about that after the kids go to bed. That night, I read link after link, post after post. Everything I read left me a little more horrified. I read about Monsanto, seed patenting, genetically modified organisms (GMOs). The first GM food crop, RoundUp Ready Soybeans, were commercialized in 1996. Corn, cotton, canola and sugar beets quickly followed. Not only had these foods been modified to be resistant to herbicide (read: poison), many of them had also been modified to resist insects. Our food is producing pesticide! The realization that I had been feeding my children these genetically modified foods for their entire lives left me sick to my stomach. Never mind that I had no idea that it even existed. I had just spent three hours reading about all the negative effects that GM food consumption has on humans and animals. I became overwhelmed. Perhaps distraught would be a better word. A look through the foods in the pantry confirmed what I already suspected. Almost every single package of food had at least one of these GM ingredients. In most cases there were two or three. I was ready to throw it all out and start from scratch, but I had no idea where to start. I had to come to terms with the fact that I couldn't change everything at once, but began making baby steps to eliminate these foods from our diets. Each of these baby steps have added up to some big changes. 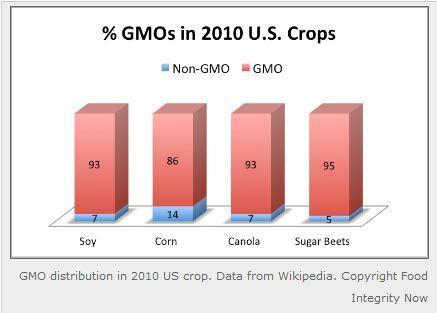 Sometimes we just can't avoid eating foods that may have suspect ingredients, but I estimate that our diets are now about 95% GM-free.